2016 marks the 100th Anniversary of New Hampshire’s First in the Nation Primary the first primary was held on 14 Mar 1916. My friend Janice Webster Brown blog about the First in the Nation History. You can read her Cow New Hampshire History blog post here. 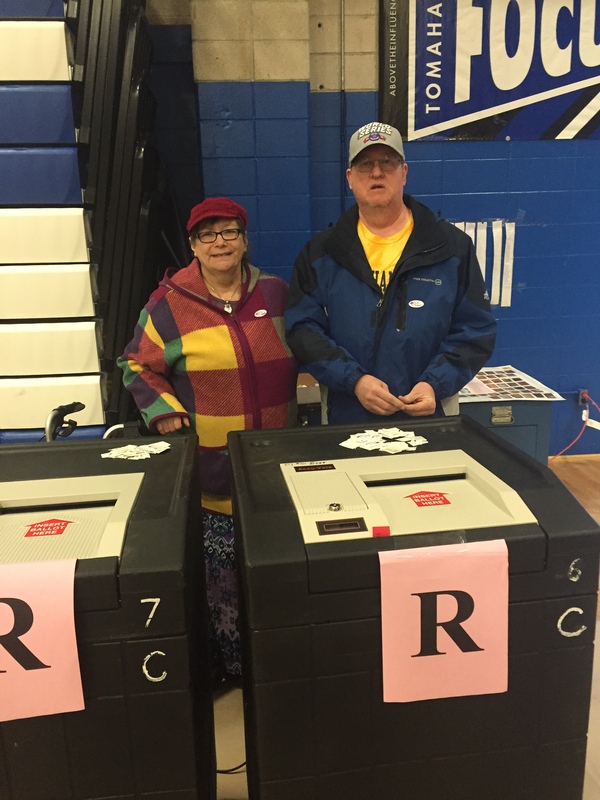 Michael Daniel Butka and June Lee Stearns Butka both voted on 9 Feb 2016 in Merrimack, Hillsborough, New Hampshire at 10:15 in the morning. One of the volunteers kindly used my husband’s IPhone to snap a photograph of us. He asked us to stand behind the machines that insert your completed ballot into. I didn’t notice that we were standing behind th,e “R” for Republican, box. Michael is a registered Democratic. I am a registered Independent, who declared, either Democrat or Republican, in this Primary election. I was able to return to my independent status before leaving the balloting area. I will not say who I voted for. In our extended family keeping your council is the wisest move to make. I always encourage my family to vote, weather they agree or disagree with other family members choice. Our ancestors fought for and sometimes, gave the ultimate price, for our right to vote. Vote your conscience. You are the only one who needs to live with your decision, no one else. Review digital files for duplicates and streamline my hard drive. It appears to be running out of space. Just have fun, relax and enjoy the day.